Dr. Nguyen Thi Kim Chi joined at Cao Thang Eye hospital (CTEH) since 2003. 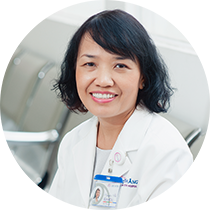 Doctor Nguyen Thi Kim Chi is in charge of diagnosing and treatment the full range of eye diseases including consultations of eye care. Doctor Nguyen Thi Kim Chi obtained Medical Degree in year 1997. Graduated from Ophthalmologic Specialist training Level I in 2003. Working as an ophthalmologist in eye disorder treatment department of Medical Center in Nha Be District, HCM.